Did you know that your sewing machine can stitch a perfect blind hem stitch? You can use the Blindstitch foot#5 with your machine’s built-in Blindstitch to create a quick and professional blind hem! The foot and the stitch are just one part of getting a good result, the other trick is folding your hem in just the right way before stitching with your machine. There are a few great videos you can check out for specific information on this technique. 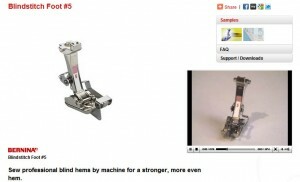 First, you can visit a short informational clip about Blindstitch Foot #5 at BerninaUSA.com to learn a bit about the foot and see it in action. And this is a great video tutorial from DraperyIdeas about How To Sew A Blind Hem on a Bernina, showing exactly how to fold your hem to get the best results. And, if you happen to own the fabulous BERNINA Feetures: A Guide to Presser Feet, Accessories and Attachments, you can flip right to Unit B, page 11 for all kinds of detailed facts, instructions and tips to get the most from your Blindstitch Foot #5. If you are asking yourself, “What is this fabulous Feetures resource and where do I get it?” here’s the skinny! Feetures is a series of three volumes that include wonderful information on how to use each and every sewing machine foot, accessory and attachment and includes all kinds of tips and tricks. From a simple straight stitch foot to the bias binder and everything in between, these books are an excellent set of reference tools. Ask at your local BERNINA Dealer store for information on purchasing the Feetures books.